Will the GLA have an unarmed scout buggy? Im so derp, great job nontheless! I must ask, are Naval Vessels still in the mod or where they never released? If you need any help testing, I have a lot of free time lately. Would love to see more of your work! Okay when I need will ask for your help. Can you play online? It is true. Read some information. I know but F-117 is not Raptor or F35.For detection enemy tactical fighters as F-22 and F-35 you need AESA radar not old Surn/Cube. Vice Admiral, does this unit eat junk and upgrade? Alexei stealth fighters and stealth helicopters will be shut dawn from Surn -GLA. For Game Balance -GLA can not shut dawn stealth unit as B-2 spirit or F-22. It is only GLA. So GLA Heavy AA will need a deployed radar too just like the others? This is the new GLA radar vehicle. 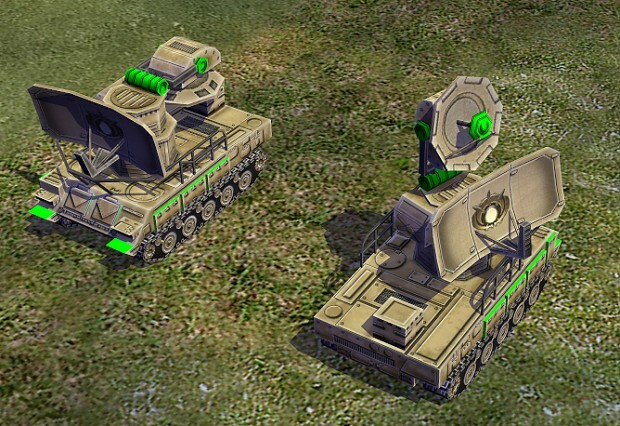 It has similar deploy function as other radars in game. The old radar van will be used as early scout unit.